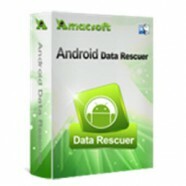 – FREE priority for any technical support. – Enjoy all features of the product without limitations. Categories: Mac OS, Office & Business, Multimedia & Design. Tag: Apowersoft. 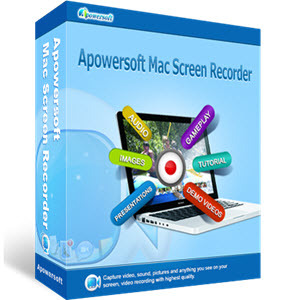 Apowersoft Mac Screen Recorder is a professional software that features advanced recording function, powerful video converter and a smart task scheduler. When using this Mac OS screen recorder, you can feel free to make screencast on your screen in full screen, customized area and even capture your web camera. In additional, it’s also feasible to make picture-in-picture video through adding webcam in recording area. When recording is finished, the video will be saved to your local drive in the format of MOV which enables you to directly upload the video to YouTube without conversion. Moreover, the built-in converter allows you to convert local video files to various formats, such as MP4, AVI, SWF, FLV, MKV and many more with no quality losses. This wonderful application enables you to record everything happening on your screen with great quality. You are allowed to make demo videos for training or teaching, and create video tutorial for video game and even product displays. 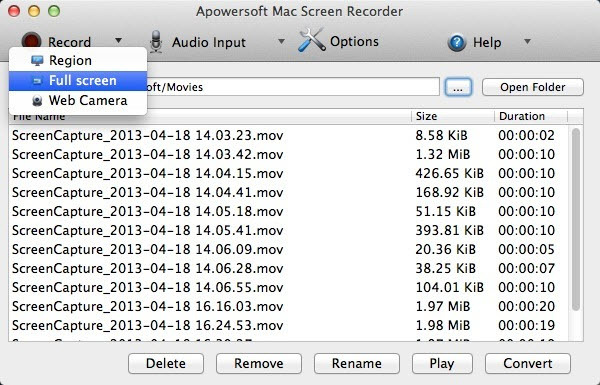 You’re also allowed to record screen on Mac with audio from system sound, microphone or both. This feature is extremely beneficial to make video tutorial more vivid. Even more extraordinary, it’s capable of recording screen activity and sound in high sync. 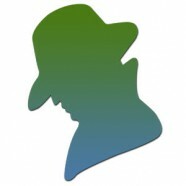 If there’s a webcam (built-in or external device) equipped in your computer, you can make webcam video with the recording mode of “Web Camera”. Meanwhile, when recording, you can create picture-in-picture video by clicking webcam icon on the tool bar. The recorded video will display all your screen activity along with your face. Are there any moments that you want to record screen on Mac OS X El Capitan at later time? If the answer is yes, the task scheduler may come in handy. This additional tool allows you to schedule recording task based on your preferences, such as trigger time, duration and region. The recorder will work automatically once the scheduled time comes. You will find this tool convenient, because it can even record screen at your absence. It also comes with a screenshot tool on the main interface, which allows you to capture any scene on your screen as image. You can make use of this tool to create a fantastic album. Once you have captured a screenshot, you can go further to edit it by clicking the pen icon on the tool bar. Next, you can instantly share the image to internet and social networks such as Twitter, Facebook and Flickr. When you’re recording screen or taking snapshot, this Mac OS screen recorder will smart editing tools which are really easy to use. Therefore, you can highlight and enhance some important parts on screen with various editing options like rectangles, arrows, lines, circles and texts. The built-in video converter of this application provides enormous formats for video conversion like AVI, SWF, MKV, MP4, FLV, MPEG, 3GP and popular formats for Apple, Android and Sony devices. It allows you to batch process multiple videos at once. Furthermore, you can make use this converter to trim, crop and even merge video clips. Have you ever thought of publishing high definition video then upload to YouTube for sharing with other people? This superb recording software is capable of generating awesome HD videos on Mac OS El Capitan for YouTube. When you have selected regional recording mode, you are allowed to choose 720p, 1080p and other fixed resolutions to record Mac screen upon the recording tool bar.